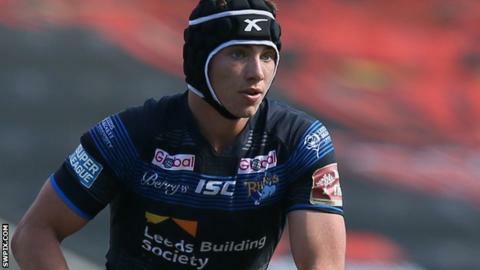 Leeds Rhinos coach Brian McDermott has said he is disappointed teenager Jack Walker has turned down a three-year contract. The 17-year-old has made six appearances for the Rhinos since making his debut earlier this season. McDermott told BBC Radio Leeds: "It's disappointing but we move on. I don't want to appear cold. "We wanted him to sign and he didn't. It's a shame that it doesn't look like he's going to be with us." In a statement on the club website on Wednesday, Walker said he had rejected the contract offer because he did not feel he would be able to play in his favoured position of full-back. He said: "The club has a great young full-back in Ashton Golding who is only two years older than me and who recently signed a four-year deal, so I need to look at my future and make the right call on my career going forward." However, McDermott does not think that it is essential at this point in Walker's career that he focuses solely on one position. "He's 17 and I don't see him specifically for any position just yet," he added. "Clearly he can play full-back and he's been good for us. I think he could be extremely good if he stayed with us. "I think he has caught the eye of a lot of people and his performances have been magnified. "I don't think any 17-year-old should be getting wrapped up with only ever wanting to play one position."